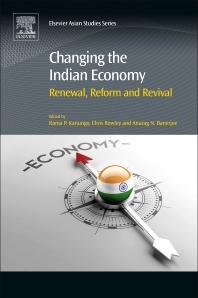 Changing the Indian Economy: Renewal, Reform and Revival explores the fact that post-Modi India is witnessing unprecedented socioeconomic change, truly labeled as Modi’s Mantra and his attempts to morph the Indian economic landscape. India is using an intelligent economic process for its renewal and growth, however, in a recent study by Nomura, 2016, The Japanese Financial Services firm, it is reported that there is downside risk to India’s baseline forecast of 7.8 per cent GDP growth in 2016. Although the report suggests that there was a mid-cycle consolidation in mid-2014, the recovery seems to be losing momentum. This book offers a novel, but inclusive outlook to the entire post-Modi economic overhaul. This section outlines a brief background scope of the post-independence position of Indian economy and narrates the present context. One article in this section. This section presents a time-line description of all the Five Year Plans including the 12th Five Year Plan with a focus to Post-Modi economics. One article in this section. This chapter discusses the interrelatedness of Indian Economy with Financial planning system. Particularly, outlines the pertinent and contemporary challenges/issues and their effects. Future possibilities of financial planning for financial literacy, implementation of international standards, and financial transparency leading to professionalise the financial sector of India. The current changes that reflect Modi’s reforms, stewardship and vision. Are they tenable? Two articles in this section. This section describes how resource allocation and channel distribution could optimise economic growth for India under new economic initiatives. One article in this section. This section, beyond the historic trends, outlines how the Modi’s government is facing the counter-cyclical measures undertaken in the past years and what difference could they make with their new provisions? How they could balance revenue and expenditure by taxation, public expenditure and public borrowings readjustment. Is there an intelligent way? One article in this section. India has introduced a number of reforms in the taxation structure, i.e. rationalisation of tax structure; progressive reduction in peak rates of customs duty ; reduction in corporate tax rate; customs duties to be aligned with ASEAN levels; introduction of value added tax ; widening of the tax base; simplified tax law for better compliance. Are such incentive driven provisions productive? In addition, the recent GST (Goods and Services Tax) as a measure of comprehensive indirect tax will be discussed with a clear explanation of tax credit exemption for the businesses. One article in this section. This section offers a discussion on the key changes to facilitate external investment, FDI, inclusive industrialisation and supportive regulatory regime. In light of the World Bank index ranking to do business with ease, currently India stands at 130 among 189 countries. Thus, it’s imperative for India to embrace wider industrial policy to develop key sectors parallel to core sectors. One article in this section. This part outlines latest trends in socio-economic liberalisation process of India and where the process is hindered. India has recently taken several socio-economic liberalisation measures. However, the benefits reaching to the least privileged class on India remains elusive. In addition, the gap between industrialised countries and emerging countries like India, is one of the key challenges in front of the Modi government. One example—recent Davos Forum debate on renewable green energy. The 2016 Index of Economic Freedom for India is 123. The Snapshot of India reports that the reform is limited and uneven. Two articles in this section. This section presents what is trending in the Indian economy and the timeliness of the government response to these strategic changes. Most importantly, this part highlights the public perception to the economic changes in light of recent government’s initiatives. The survey conducted by the Centre for Monitoring Indian Economy reports that a negative perception on spending is registered. The question remains— if the economic situation is really changing via intelligent reform of economy and the government is efficiently responsive to these measures or is it just a much hyped repackaged of politicking? Two articles in this section. A much argued debate contends, Civil society plays a critical role in reforming the state, both social and economic condition of it. This part offers a critique on how civil society could influence and determine the structure of governance so that an economic renewal could be possible and market-driven economy could grow. The impact of cooperative engagement and collective vigilance could facilitate in framing the policy measures. Two articles in this section. Much of his research is driven by the more realistic, fundamental and empirical process of decision-making, that is surrounded by analytical and computational queries to study Public Finance, Economic Changes, Restructuring, Merger and Acquisitions (M&As), Risk and Liquidity within capital market and beyond. He is well versed in Indian economic changes and brings in his consultancy rich perspective to research outputs. Rama holds a number of memberships in scholarly forums and professional agencies, i.e. Euro Working Group of Financial Modelling (EWGCFM), Fellow of the HEA (Higher Education Academy), CMI (Chartered Management Institute), Asian Development Bank (ADB) and the British Accounting Association Corporate Governance Special Interest Group.